Once a year, perur athama would grind curry masala powder. The quintessential masala powder used for kurmas, chicken and mutton curries. She would put in so much of effort right from selecting the chillies and spices, dry roasting them, drying them in the sun so its absolutely dry and lasts for a long time, grinding them etc… Her long time driver Kennedy would load the jeep with all the roasted spices and carefully take it to the rice mill and grind it to ammas preference. The hot ground masala was spread on newspapers lined in the dining room to cool. The entire house smelled of the masala. After 3-4 hours of cooling, the masala was carefully packed and stored in the kitchen store room. 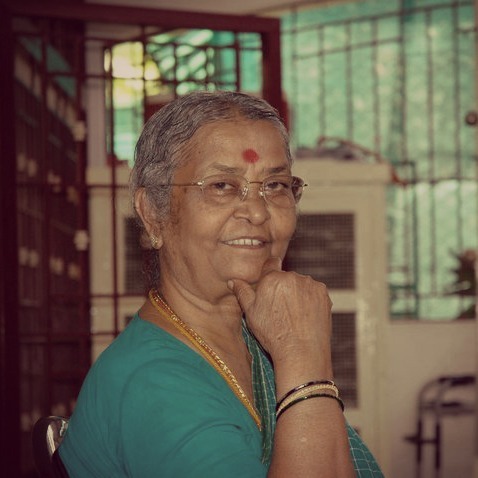 Perur athama was persnickety and her kitchen ran on a zero error policy. Everything was carefully looked upon and her dishes are legendary in our family. She is a true treasure. She would also send the curry masala spice powder in nice stainless steel boxes sealed on the outside with another plastic bag to all of her family. It lasted for an year. She is getting quite old now and I wish her a lot of health. This recipe is legendary and can turn even an ordinary recipe to something gourmet. This recipe can be doubled or tripled according to your needs. 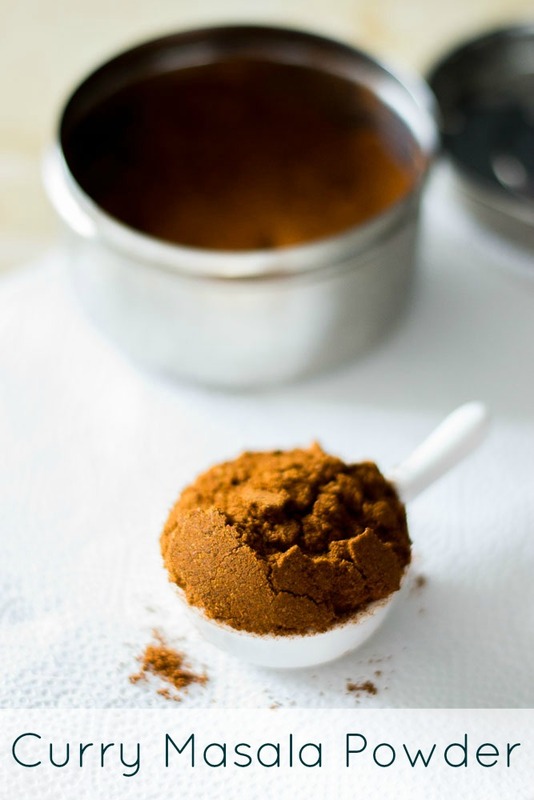 Here are some tips to be followed so the masala powder lasts for a long time. # Make sure the ingredients are well roasted. # Spread the ground masala on a newspaper and allow it to dry completely. 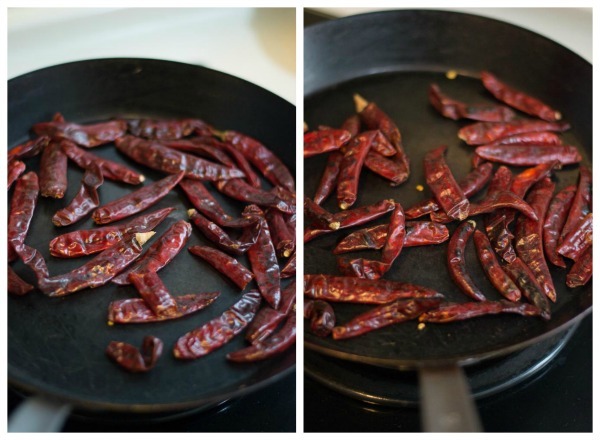 The grinding process makes the masala hot and it needs to be completely cool before you can store it in bottles. # For retaining the freshness of the masala, store the masala in the freezer and use as required. 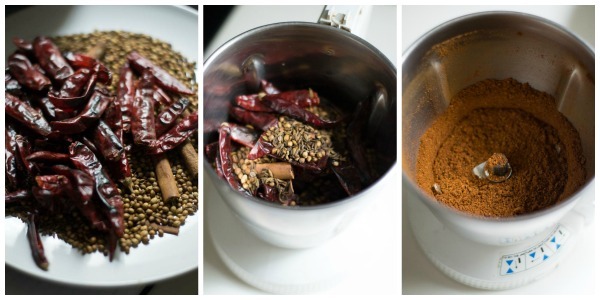 Here is how to do home made curry masala powder. I make this masala once in a month and grind in my mixie. You can double or triple this recipe if you want to. This recipe is so versatile. Use it while making kurmas, chicken or mutton dishes. Just a tablespoonful of this masala makes the dish very flavorful. Dry roast all the ingredients separately until well roasted and fragrant. Set aside on a plate to cool. First lets dry roast the red chillies. Dry roast the chillies on low flame until the chillies starts to fluff up a bit and is brown here and there. Please use caution to not burn the chillies. The entire masala will be ruined if burnt spices are used. Set aside on a plate to cool. Add in the rest of the ingredients and dry roast till its very fragrant and the seeds are slightly brown. If your are doubling or tripling the recipe, dry roast in batches. Wait for the roasted spices to completely cool before grinding. Grind the spices to a very smooth and fine powder. 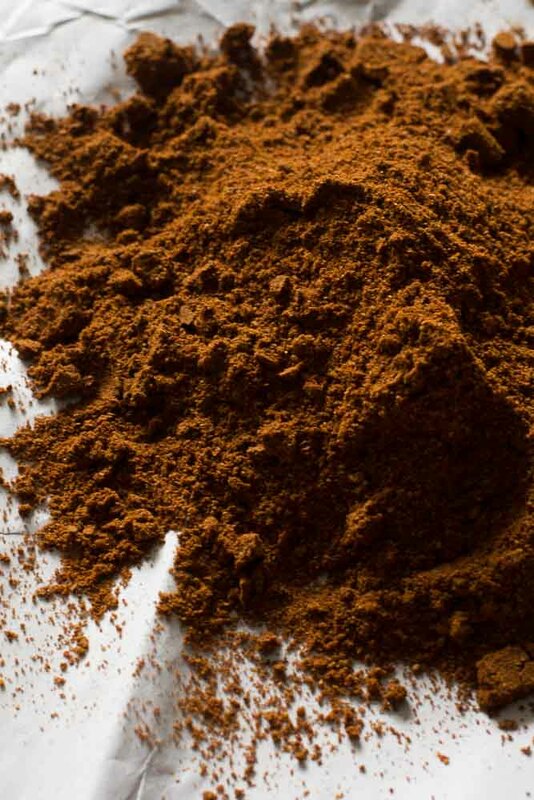 If the quantity is large, then grind it in batches. Spread the ground masala on a newspaper to cool. Let it completely cool before you can store it in bottles. 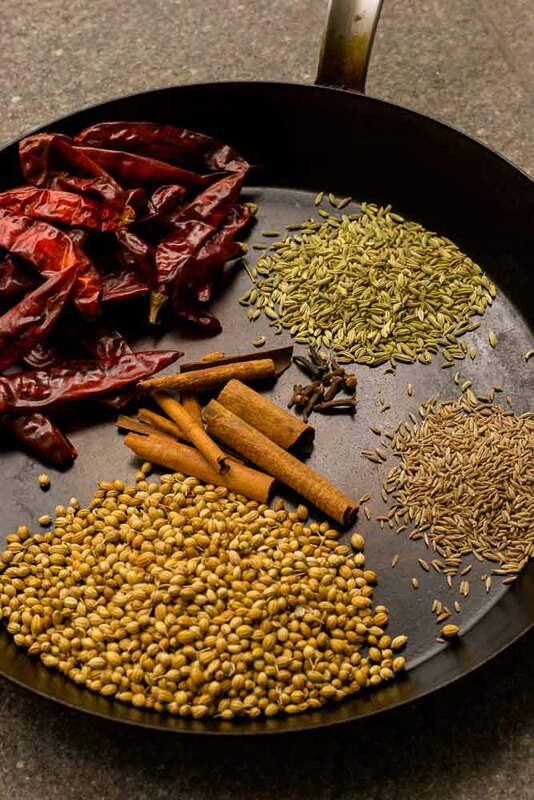 Here are some of the recipes you can make with curry masala powder. 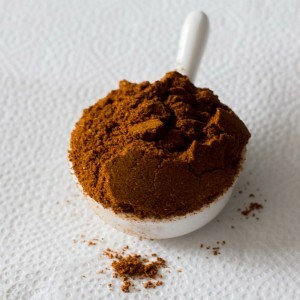 Recipe or making home made curry masala powder. South Indian Style curry masala powder used for kurma and non-veg dishes. Dry roast the chillies on low flame until the chillies starts to fluff up a bit and is brown here and there. Please use caution to not burn the chillies. Hi Akka, Iplan to use corriander powder instead of corriander seeds.. how much powder should i add instead of 1/2 cup corrainder seeds. The store bought coriander powder might not be roasted. So please use seeds. Can we use the above curry masala powder to make ‘Dhalcha’? For example chicken and mutton kulambu panrom na intha Masala mattum pota podhuma vera yethum masala vum additional ah add pananuma? You can use this as a flavoring masala. for half kg, about a teaspoon will suffice. Tried it.OMG it does all the magic.Thank you so so much for sharing. Thank you Kala. Glad you liked it! Dear Suguna, Quick question, do you also have the masala powder recipe for fish and seafood curry? Kannamma Cooks is Always my go to page for traditional Indian recipes that works every time! Thank you and you are very generous. Lots love from Malaysia. Hi Priya, I grind fresh masala for fish fry and that can be taken from the site. For storage, the masala can be stored in the freezer. Awesome ! I am going to try out this recipie ! Hi Kannamma,I like your recipes.I want to know whether curry masala powder can be used for veg curries. akka naa curiosity la solla miss pannitten unga blog recipes ellam simply superb! enakku unga blog evlo pidichadhunna phone eduthave unga blog poganumnu thonudhu keep up the good work:) இனிய பயணம் தொடரட்டும்! 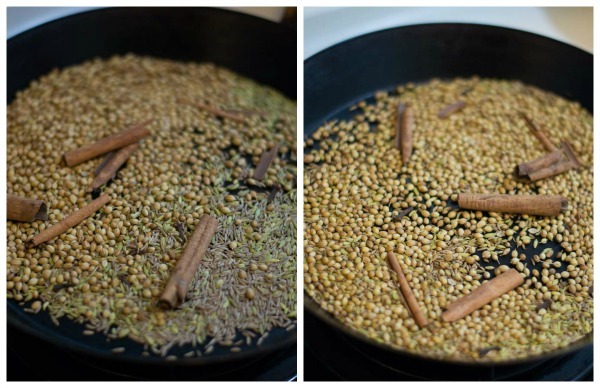 i mean coriander seeds 1/2 cup nu irukkulla adhu andha cup measurement ketten. i mean coriander seeds 1/2 cup nu irukkulla adhu andha cup measurement ketten. akka naa romba curiosity la solla miss pannitten unga blog la recipes ellam simply superb!! unga blog evlo enakku pidichirukkunna kaila phone eduthave unga blog polam apdinnu dhan thonudhu keep up the good work akka! இனிய பயணம் தொடரட்டும்! Thank you so much Nisha! Made my day! enakku oru doubt ennanna curry masala powder seiya andha cup measurements enna? can you explain it a little. I dont understand. I am 77 years and cook my own food most of the time as I am a vegetarian. My wife cooks chicken and fish for herself once a week but eats the vegetable dishes most of the time. I like your simple recipe for curry powder. I also grind my own masala after roasting the seeds but use chillie powder from the shop instead of dried chillies . However.I also add dried fenugreek seeds and sesame seeds. That’s nice to know sir. I think each family has their own spice blend. Thank you so much for saying that Radhi Venkat. Happy cooking! Can this powder be used as a substitute for Garam masala powder? This is more of a south indian style masala powder. Vanakkam…. that’s great to have another podi recipe from an expert’s kitchen. In fact all your podi recipe are worth mentioning here. Besides, the one from chettinad irulai roast and vaazhaikai podimas , the powders we grind are really too good to deserve special appreciation. I always prepare extra to use in busy morning to give KC touch. I call it masala podi, mandhira podi, sokku podi…..whatever it’s truly rewarding…keep going deary?. haha. Thats so funny. Really glad that you like the podis. Thank you so much. Glad that you liked the recipe. Happy Cooking. Thanks for the recipe Suguna, I was searching for it for a long time. I made the Kumbakonam Kadapa and it tasted awesome, been making it quite often for idli.